Boring is a very important word. If you attain boring, then everything is boring. Then this is no desire, no anger, no ignorance. Desire is boring; anger is boring; ignorance is boring; everything is boring. Then, you will get Enlightenment. So boring is very important. Everything is equal. But people don't like boring. They want something, and boring is not interesting. It's like clear water. Clear water has no taste, but no taste is great taste. Everybody likes ice cream, but eating ice cream all day is not possible. However, if you're thirsty, clear water is wonderful any time - better than honey, better than ice cream, better than anything. The truth is like this. In Zen no meaning is great meaning, and great meaning is no meaning. We call this zero mind. I go around and ask, "Is zero a number?" One time in London I asked this, and somebody said, "Yes, it's a number." So I said, "Yes, if you say zero is a number, you can do everything. Let's look at this. 9 x 0 = 0. Then, 9 = 0/0. O.K.? Then, if you say it's a number, then 0/0 = 1. So 9 = 0/0 = 1, and 9 = 1. Then he said, "Ah, zero is not a number; that's not possible. 0/0 = 1 is not possible." "O.K. ; not possible is O.K. Then, 9 x 0 = 0. That means 9 = 0/0. 10,000 x 0 = 0. Then 10,000 = 0/0. 0/0 means 0/0 = 10,000 and 0/0 = 9. So 9 = 10,000. "Zero mind can do anything. If you say zero is a number, that's O.K. If you say zero is not a number, that's O.K. ; it doesn't matter. Zero is everything; everything is zero. This is Zen mathematics, O.K.? So zero mind is very interesting. If you keep zero mind, then you can do everything." Then someone asked, "Soen Sa Nim, you talked about a child's mind as Buddha's mind, very simple, before memory. Before memory, all children's minds are correct mind, Buddha's mind, Enlightenment mind. Is this correct? Sleep time, sleep; eat time, eat. But a child only thinks of itself. Is this correct Buddha's mind?" "A child's mind is nothing at all; it is zero mind. It's like a clear mirror. Red comes, red; white comes, white. Only reflected action: when a child is hungry, it eats; when it is tired, it only sleeps. "Enlightenment-mind means using this child's mind. A child only keeps Buddha's mind. Using this mind is called Bodhisattva's mind. So, child's mind is correct Buddha's mind; Bodhisattva's mind correctly uses Buddha's mind. How is it used? A child has enough mind - he only eats. But if somebody is very hungry, a child doesn't understand. If you have Bodhisattva-mind, then if hungry people appear, you give them food; if thirsty people appear, you give them something to drink. Keeping Buddha's mind and using Buddha's mind are different. Keeping Buddha's mind is correct Buddha's mind. Using Buddha's mind is Great Bodhisattva mind. "Great Bodhisattva mind has a Great Vow. What is a Great Vow? That is only-go-straight don't-know mind. Only go straight - don't check me; don't check my feelings; don't check anything -- only reflect everything and help all people. This Great Vow is infinite because space and time are limitless and beings are numberless. Numberless beings means numberless suffering, so my vow is a numberless vow. Its name is Great Vow. 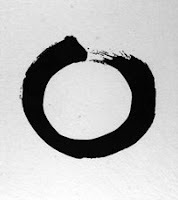 :: Previous post on Zen Circle: a poetry.